You may not use your fireplace as often when springtime’s warm weather comes, but the fireplace nevertheless remains the focal point of your room. So be inspired by the variety of color schemes, arrangements and materials in these Easter mantel decorations to create your own springtime fireplace decor. 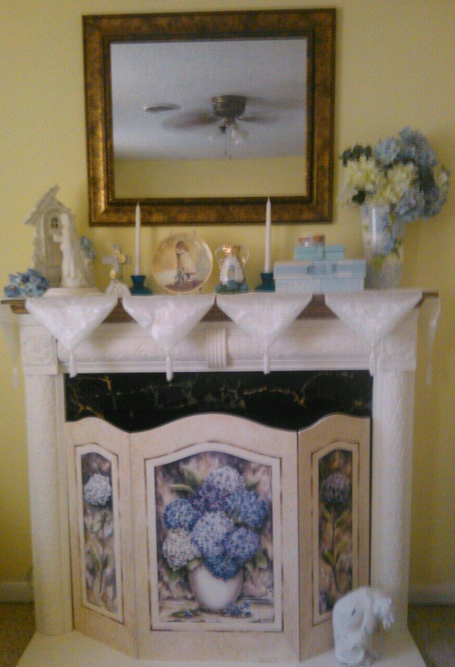 Springtime blues and crisp white, a classic color scheme, combine on this Easter themed fireplace mantel. The gold of the mirror’s frame is repeated within accents in the arrangement. And the springtime yellow of the wall gets picked up in the flowers. Hydrangeas appear not only on the mantel but also on the summer hydrangeas fireplace screen. A green mantel scarf grounds this Easter mantel. 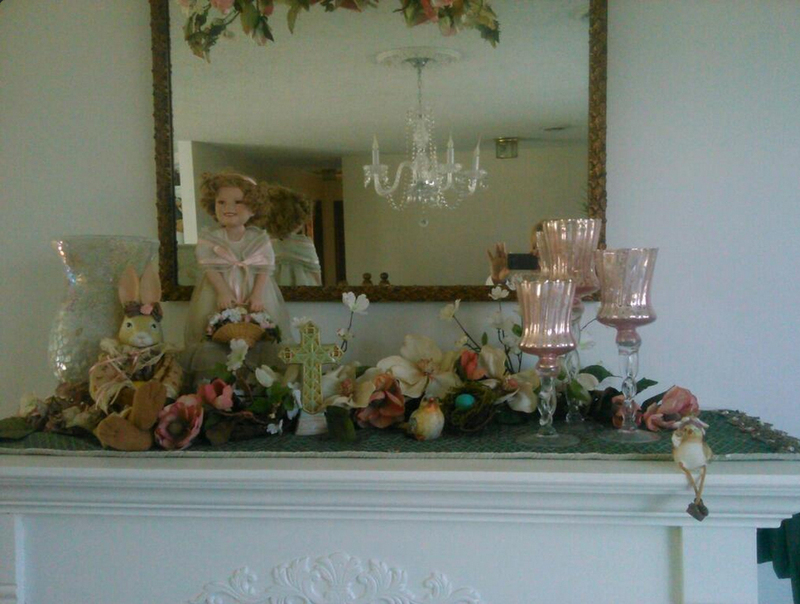 The vintage Shirley Temple doll and friendly stuffed rabbit, both with pink, lighten up the theme. The pink is carried through the in flowers and the trio of stemmed candle holders. The little chick seated on the edge of the mantle is a whimsical touch! 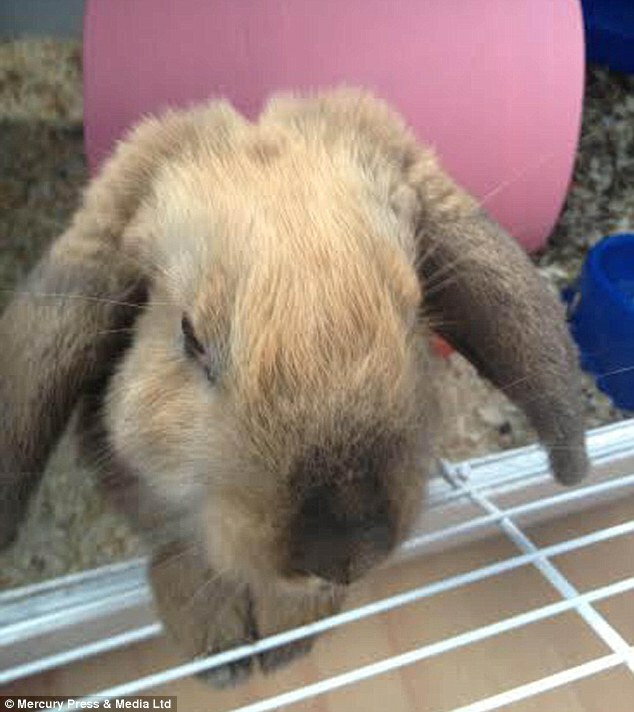 TheSeasonalHome has used paper products – from ribbon to scrapbook paper – to bump an Easter mantel from good to GREAT! The yellow and white gingham ribbon accents the white mantel and is reiterated on the rim of the yellow flower pot. And the paper butterflies! Their diagonal flight-path counterbalances the strong vertical lines of the white candle holders and picture frame. 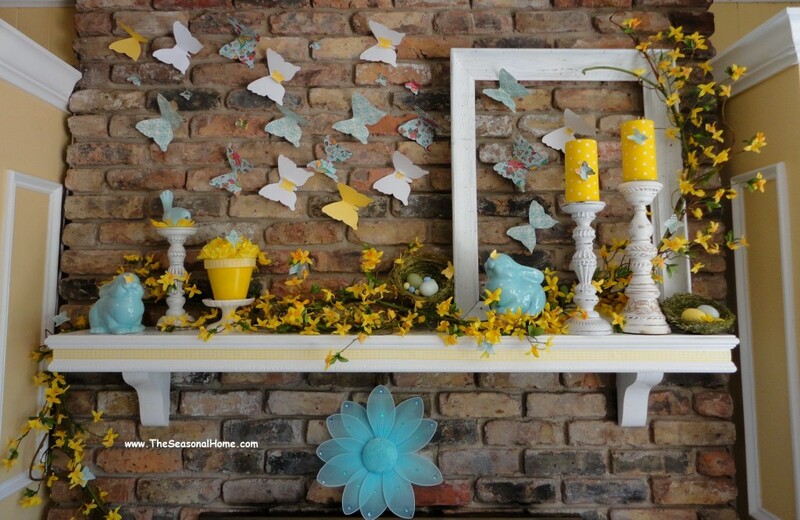 This spring and Easter mantel was created by TheSeasonalHome. The antiqued mirror above the mantel was the inspiration for the mercury glass candle sticks and vase. The gold trim on the mirror is repeated on the frame of the cleverly created chalkboard platter as well as in the garland. 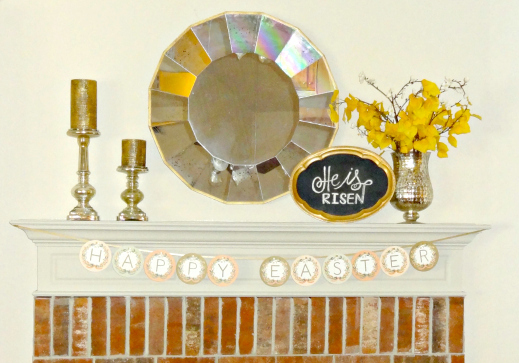 TheGoodLifeBlog has created a simply elegant and inspiring Easter fireplace mantel! TheGoodLifeBlog shares how she created this Easter mantel arrangement. If you won’t be using your fireplace at all this spring, a fireplace candelabra can not only create an Easter vibe but also keep your fireplace from suffering from Black Hole Syndrome. Just fill the candelabra with candles in pastels that will work with your room or with Easter egg shaped candles. This adjustable width Olivia Candelabra can be used either on the fireplace mantel or inside the fireplace. 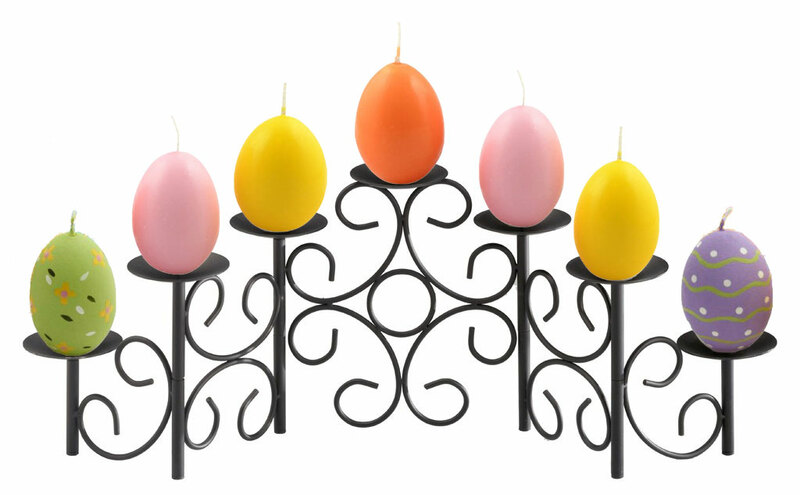 Add Easter egg candles to a fireplace candelabra to decorate the fireplace mantel or to fill the empty space inside the fireplace. 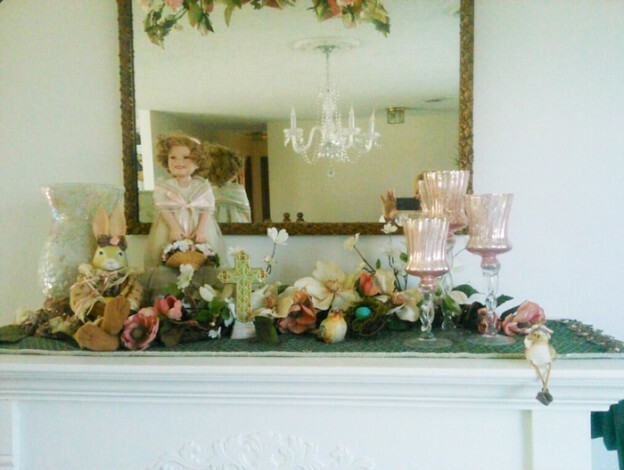 Looking for still more ideas for decorating your fireplace mantel for Easter? 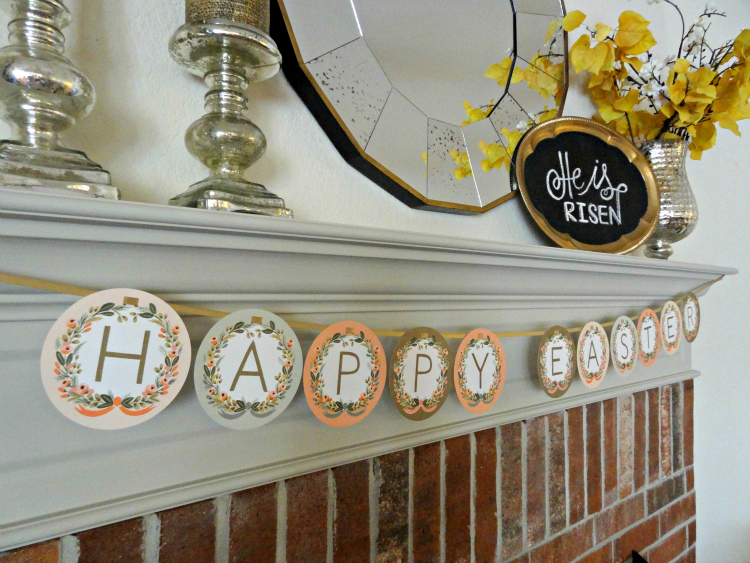 Here are some super quick way to turn your fireplace mantel into an Easter or springtime display. Every leprechaun needs a pot of gold at the end of a rainbow. And every home or business with at least one chocolate lover needs a leprechaun’s pot of gold (foil chocolate) coins to celebrate St. Patrick’s Day. 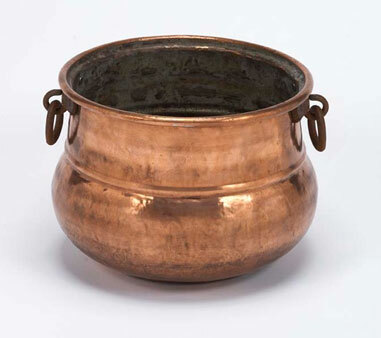 When not in use as a leprechaun pot of gold, this cauldron can serve as a plant pot, wine cooler, container for fire starters on the hearth, magazine holder, or a host of other practical uses. Next, decide if you want to make a leprechaun pot of gold full of chocolate, foil-wrapped coins or only appear to be full of coins. Chocolate enthusiasts will prefer the former while dentists may prefer the latter. The number of chocolate coins you will need, obviously, will vary depending upon your decision. 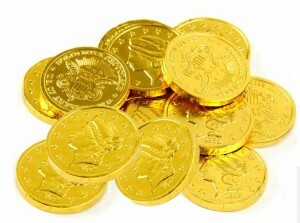 Gold, foil wrapped milk chocolate coins can be purchased online by the pound. 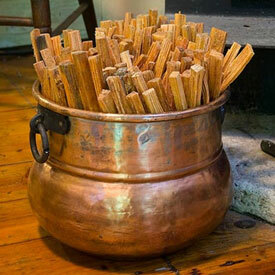 If you only want the illusion of a pot filled with gold coins, stuff crinkled newspaper into the cauldron. Then invert a paper plate over the the pile of newspaper. This provides a slightly domed surface upon which the chocolate coins can be scattered. 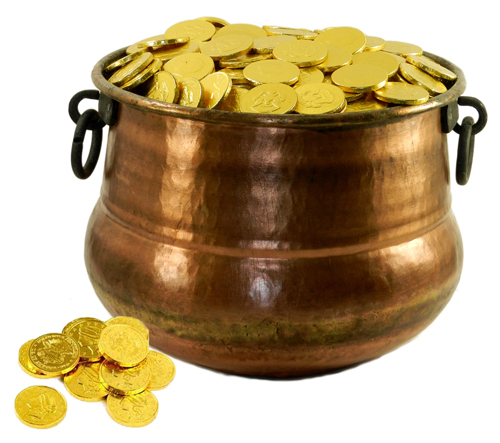 When filled with gold coins, select a place to display your leprechaun pot of gold. 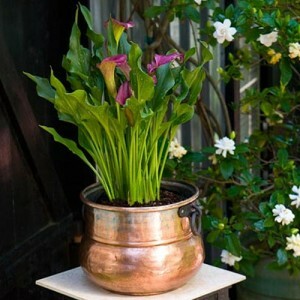 Consider it as a dining room table centerpiece, coffee table accent, decor on a stair landing, or holiday accent in the foyer to greet your guests. At work, put it on the receptionist’s desk or the conference table, or, if you like frequent visits from co-workers, your own desk. 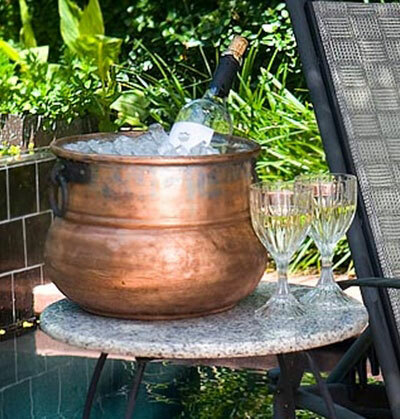 Wherever you place it, scatter a few gold chocolate coins at the base of the cauldron. Leprechauns have been known to sneak pieces coins out of the pot when no one is looking. And perhaps one day you’ll find a rainbow ending just above your pot o’ gold. Gas fireplaces need two things to work: fuel and a means of igniting the fuel. 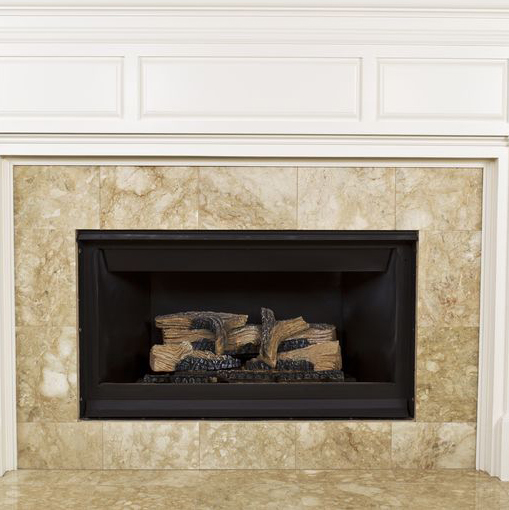 Let’s troubleshoot these two critical elements if your gas fireplace will not ignite. If your gas fireplace won’t light when you turn it on, check the fuel supply. 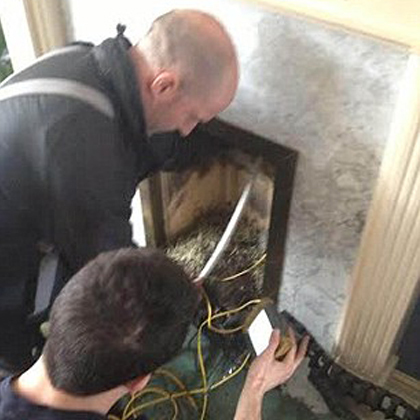 Is the gas valve near the fireplace open? If the fireplace runs on LP gas, is there fuel in the LP gas tank? Is the valve at the LP gas tank open? 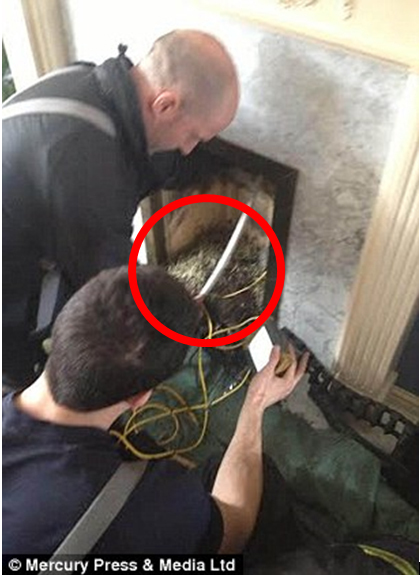 If the fireplace runs on natural gas, make sure any valves between the meter and the fireplace are open. 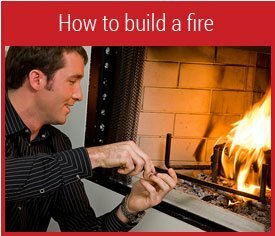 If gas is reaching the fireplace, but it still won’t light, the next step is to light the gas jets on the gas logs, manually, following the manufacturer’s instructions. If the logs light and stay lit, that proves that you have a supply of fuel and that the jets in the fire logs are not plugged by carbon build-up. It also suggests that the problem is in the ignition system. If the vent free gas logs or vented gas logs still will not ignite, the most likely culprit is a dirty pilot light, or a pilot light that is not lit. If the pilot light is out, follow the manufacturer’s guidelines for re-lighting it. If the pilot light device is burning with a yellow flame, turn off the gas valve to the fireplace , take the pilot light device apart and clean it. After you clean and replace the pilot light device, it should burn with a strong blue flame, and it should ignite the fire logs. If the pilot light won’t stay lit, the thermopile may have weakened over time. The thermopile translates heat from the pilot light to electricity that opens the gas valve so the gas logs can light. Replacing it is a job for a certified gas technician. For fireplaces ignited by a wall switch or by an electronic ignition device, the next step is to check the fuse or circuit breaker that powers the ignition. The fireplace should have its own circuit. If it’s on a circuit with other appliances, an overload can blow the fuse or circuit breaker. Replace a fuse if it’s blown or reset the circuit breaker if it is tripped. Move the appropriate breaker to the off position and then back to the on position. Now try to light the fireplace. If it won’t light, there are two further things to check. You can test the wall switch that turns some gas logs on by removing the wall plate, taking the switch out of its junction box and connecting the two wires on the switch to each other. If doing this lights the logs, replace the switch. There’s only about 1 volt in this system, so it’s perfectly safe to connect the two wires. Just be sure you have the right switch. The switch for the gas fireplace may look exactly like a light switch with 110 volts! Finally, inspect and clean the thermocouple and thermopile if they are coated in ash or soot. These two components are heated by the pilot light and perform related functions. One of these devices is located on each side of the pilot light. You can clean them with a small stainless steel wire brush and extra fine (000) steel wool. If the thermocouple and thermopile are coated in soot, your gas logs probably are, too. Although that won’t keep your gas fireplace from lighting, you will want to clean the logs with a gas log cleaner. If it is time to replace or upgrade the logs for your gas fireplace, make sure you purchase the correct type to match your fireplace: gas logs for vented fireplaces or gas logs for vent free fireplaces. You have now completed all of the Do-it-Yourself tasks involved in making your gas fireplace work. If the gas fireplace will not ignite after you complete these check-up steps, contact a certified gas technician.